In use the CODEX runs very warm. 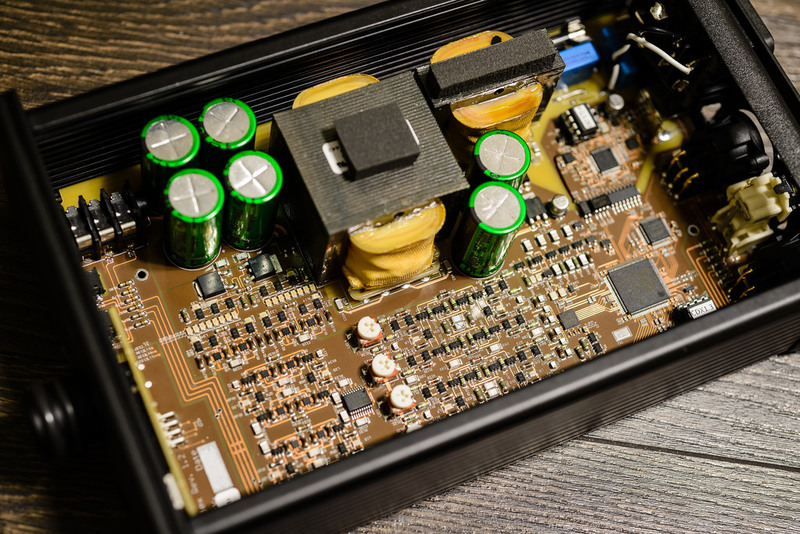 The marketing material talks about push-pull, discrete power supply which likely is the cause (it is a little power amplifier that works on DC). I did all of my testing with USB as usual. The CODEX was plug-and-play with Windows 10 Creators edition. Mains leakage is reduced but that is not our problem. Our problem are those massive harmonic distortion spike with the 3rd harmonic at 3 kHz reaching way up to -68 dB. As such, by itself sets the SINAD. Ah, tell me it isn't so. Another believer in voodoo audio and imagined problems with feedback. Electronic parts are not linear. While we try to operate them in the most linear version, they do not have a 1:1 output with respect to input. Feedback was invented almost a century ago to deal with this problem. A small amount of the output is sampled and compared to the input. If they don't agree, the amplifier changes its gain to make them so. This happens extremely fast. There is no time delay as lay people imagine (in audio context). Without feedback I dare say you wouldn't be seeing these characters on your screen! Or make phone calls. Or stream audio/video. It is fundamental to good engineering. These imagined improvements without feedback are just that: imagination. Anyway, let's continue testing. Right there with Audio-gd which likewise schews negative feedback. With RCA output (in blue) there is a spike at 180 Hz (third harmonic of 60 Hz in US). My test frequency is 200 Hz and the filtering I use for Linearity test does not exclude that. This means that at low amplitudes (all the way to the left), the mains harmonic has significant amplitude and pollutes the final output. A larger case with better separation from RCA outputs would have helped this possibly. For now, use balanced XLR outputs. As expected, we see a ton of "grass" in the skirts of our main tones instead of silence. These conspire to hide low level detail in music and cause exaggeration of high frequencies in music, making it more harsh. How anyone can argue this adds more "rhythm" is beyond me. Strange to see worse dynamic range with balanced output and such a large drop. There are both unbalanced (1/4 inch) headphone jack and "balanced" dual 3.5 mm. I have three other configurations in my balanced test fixture but don't have this so I did not test the balanced output. What a nightmare these companies have created with each having their own connector for this use. I would have liked to see around 1 ohm which is the best case situation for my testing. As it is, it not too bad but with balanced it likely doubles to 6 ohm so be careful with such headphones that have uneven frequency response below 60 ohm. This is unacceptable on multiple front. First, there is just not enough power here for a desktop, mains operated amplifier. Voltage limiting causes this which one could understand if an amp is USB powered but not here. And of course, we have our early distortion rise. If you turn down the levels to avoid this, you are down to 0.1 milliwatts of power! In this price range I like to see power north of 1 watts, not 0.27. You have some 95 dB of attenuation before you lose any channel matching! As usual I started my listening tests with the Sennheiser HD-650 headphone. Here, power was barely adequate (by desktop DAC standards). Alas, the sound was also harsher at full volume. Dialing down to 92 on the volume control made that go away but then there was not enough volume there. Switching to much lower impedance Hifiman HE-400i produced more loudness but also, more harshness. There was also lack of detail. To confirm, I switched to my Topping DX3 Pro and the difference was remarkable. The bass, resolution, separation of notes, etc. was in an entirely different class. The Topping was so good I did not want to go back to listening to the Ayre CODEX. The Ayre CODEX starts with good pedigree and a price that biases one to expect great performance. Sadly we have the opposite. On both objective and subjective front and across wide swath of measurements, the CODEX disappoints. The company says they spent four months conducting listening tests to arrive at these circuit topologies. I would have suggested they spend five minutes in a controlled listening test with a low end product done right to realize they were re-inventing the wheel and make it much less round. And then we have the high price and ordinary looks of the product here. With high-end products, you usually have great industrial design but not here. The Ayre CODEX is a great example of a company with excellent engineering talent, misapplying that to chase wrong ideas in audio. It is all an effort to have a differentiated checklist and damn true performance of the product. When I finish my audio reviews with listening tests, i usually let the unit keep playing while I type up the review. Regardless of performance, the products are usually good enough to let the music fidelity come through unchanged. This is one of the few cases that I did not do that. I was so happy to go back to my Topping DX3 Pro. Too bad Charlie isn't around any more to see this. He was absolutely and almost comically vicious to anyone who criticized aspects of his design philosophy or products. Not even a veneer of civility; it was always highly entertaining. I remember him launching into a tirade at me for questioning the efficacy of his expensive myrtlewood cable lifters. That was delightful- the world needs more people like him, things are too bland otherwise. Ugh, I thought this one would nail it. Oh well. Thanks Amir for the thorough review and sorry to deliver another less than stellar design... I thought this one would nail its as well since this is my unit. haha. If anyone would like to purchase it directly from Amir i can save them 30$ on shipping to not return it to me... anyone? no? fair enough. I wonder if its instructive for the group here to discuss what might be the parts of the euphonic colorations which make us feel that something that measures poorly sounds pleasing. I felt that the soundstage was nice and wide and deep. I wonder if that is caused by the harmonic hash adding perceived acoustic atmosphere to the recording? Or is that out of bounds for discussion on the site as its subjective in and of itself? I wonder if its instructive for the group here to discuss what might be the parts of the euphonic colorations which make us feel that something that measures poorly sounds pleasing. I used to believe in this theory but after testing product after product, I see no euphonic distortion. I think what people think is euphonic distortion is likely what they are reading into the performance and not what is really there. And they likely don't hear the small distortions I hear. I feel like my whole life i have been reading JA stereophile measurements which read "predominantly the subjectively benign third harmonic"... which i agree is not the same as saying "subjectively pleasing third harmonic". this is just horrifically bad. I doubt they ever made any good products. I’m assuming you suggested another exotic hardwood is more preferred? It sounds ok until you know the measurements. It is like fast-food, it tastes well until you know what it is made of. Let's have a look inside, Amir. That is amazingly complex for something that doesn't perform right! The zero-feedback thing is "conventional wisdom" in the high-end world. The PCB and components appear beautifully laid out and considering the proximity of the twin transformers to the analogue circuitry, it's amazing the mains harmonics aren't even worse. Appears to be four identical (differential) discrete multipole active filters and IV? Discrete H/P and Line amplification. It's a bit hard to see with the bottom part of the image obscured by the side panel, but I can see the edge of the 4th trimpot. All in all, the standard of construction and layout is in another league to the Chinese stuff- pity the performance appears to fall down. Definitely made with love I see (bias?) adjustment pots. Could be the unit is "out of tune"? I see (bias?) adjustment pots. Hard to tell, but I'd think they may be offset adjustments (DC) for the following stage/s. Problem is, you didn't measure its 'pace' and 'rhythm'. They spent 4 months designing that into it, and you didn't test that. Do you think you are being fair by ignoring this? And their Web site says they use 'killer' digital filters. Did you try and kill anything with it? I didn't think so. You might want to retest it, using some of these real world protocols. I can't find any THD numbers in the specs, now we know why. I see this over and over. The great majority of the time it tells you almost as much as if they list them. It also tells us they knew it measured this poorly. The Emotiva pre/pro sticks in my mind as you look in the owner's manual for the specs and see.......there aren't any. There also aren't any they could list that look good once you test it. I've a little more respect for some makers who have their own ideas and will tell you how it really measures without hiding anything. Even when some of the measures aren't so hot.